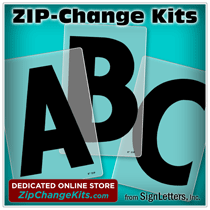 Our Metal Faced Foam Sign Letters are produced by cutting your design (either letters or a logo) from a flat sheet of high quality sign foam material and anodized aluminum (with brass or natural colors) using state-of-the-art cutting equipment. Foam letters can be produced in almost any typestyle found on our site (even styles shown for cast metal letters or formed plastic letters). We have listed several common styles here. These two material layers are bonded together to produce the finished lettering for your signage project. This sign foam material thickness will obviously determine the "depth" of the finished metal faced foam letters. As you can see from the metal faced foam lettering shown in the photo to the right, the black foam creates a "drop shadow" appearance for the foam letters. The more depth, the more of this effect on your foam sign letters.